ABOVE: The Calle de Alcalá and the Gran Vía are lined with ornately decorated buildings from a century ago. INSET BELOW: Madrid's coat of arms, from a banner in the ayuntamiento or city hall. My first trip to Madrid was in the 1960s--at a time when officials of General Franco's government were chauffeured in ancient long-hooded Citroëns, street repairmen wore blue cotton suits with lapels, teenage girls flocked to Raphael's tragic movie musical, Cuando tú no estás, and residents of apartments and pensiones clapped their hands in the street to call the neighborhood watchman, or sereno, when they needed to enter their locked buildings after dark. Today, Franco's regime has given way to a constitutional monarchy, teenage girls have no interest in singers old enough to be their grandfathers, the sereno has been replaced by electronic door codes, and city workers' wardrobes run to lime-green reflective vests or bright orange coveralls. Still, much remains the same: The Gran Vía continues to pack in the crowds with its theatres and movie houses, Madrileños still dine at an hour when Scandinavians are in bed, lottery vendors hawk their tickets on the major avenues, the Chocolatería San Ginés serves up hot chocolate and crisp churros into the wee hours, and there's nobody more dapper or dignified than an elderly Spanish gentleman in a well-cut suit. Madrid was an exciting town four decades ago (even for a young man who'd arrived from midtown Manhattan for a three-month sojourn), and these days it's an even livelier venue for locals and visitors. With 4.5 million inhabitants within the city limits and 6.5 million in the metropolitan area, Madrid isn't just a city--it's a major European capital where you can find everything from centuries-old restaurants to flavor-of-the-week nightclubs. Yes, they still have bullfights in the Plaza de Toros at Ventas, but that much-bloodied ring is now used for rock concerts, too. In short, Madrid is a tourist destination with something for nearly everyone--and as a bonus, it's one of the most affordable major cities of Europe. After 40 years, I still love the place, and I can hardly wait to go back. 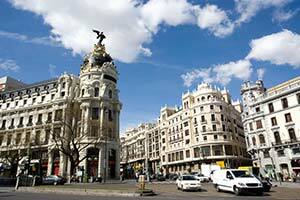 But enough about me: It's your turn to visit Madrid with the help of this guide and related articles. Top photo copyright © Duncan Walker. 3rd inset photo © Fundación Destino Madrid. 4th inset photo © Ken Sorrie.